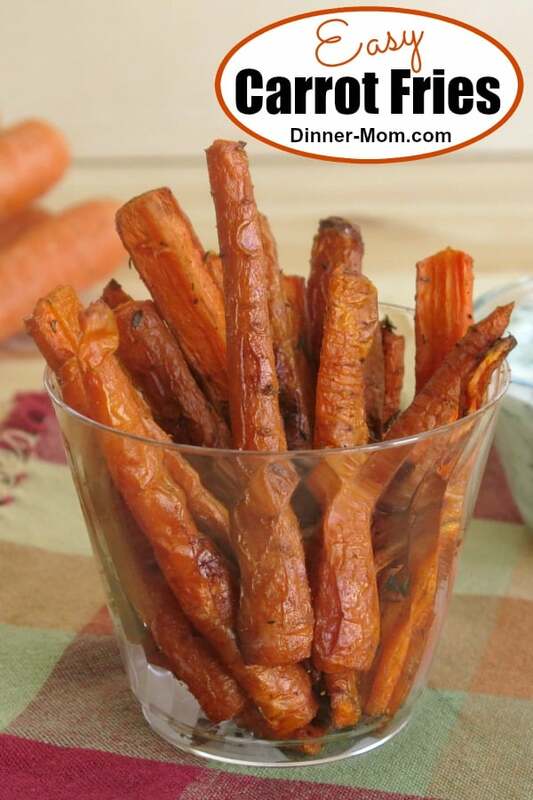 Eat an entire plate of these Baked Carrot Fries dunked in yogurt dill dipping sauce. It’s okay. They’re healthy, delicious and a fun way to enjoy your veggies. Easy recipe that’s kid-tested! When is it acceptable, dare I say even desirable, to eat an entire plate of “fries”? Answer: When you are munching on Carrot Fries with a spicy coating that have been baked in the oven! You can get away with munching on a lot of these. Don’t worry about the carrots being too hot because the cool dip offsets the heat. This combination is not only delicious, but also makes a healthy snack and side dish. We are bit obsessed with vegetable fries and chips. Once you’re hooked, check out Baked Green Bean Fries, Sweet Potato Chips and Phyllo Wrapped Asparagus. We’re here to make sure vegetables are never boring! Scrub a pound of carrots and cut them into french fry-sized strips. Don’t peel them! The look comes from the skin and it saves a bit of prep time. Here’s a little tip to prevent the carrots from rolling around as you try to cut them. After cutting the carrots in half cross-wise, cut a notch at the top of the carrot before pressing down to cut the carrot all the way through. See picture below. A larger carrot might need to be cut into more pieces. The goal is to have “fries” that are all about the same thickness so they roast evenly. After getting your hands messy and really massaging the olive oil and spices into the fries, you’re ready to roast! By the way, this recipe uses a Cajun spice mix. But, any seasoning will work. Place the carrots on a baking sheet lined with parchment paper or coated with cooking spray. Bake the carrot fries in a 425 degree F oven for about 30-40 minutes or until desired crispiness. There is room for variation here. The cooking time depends upon the thickness of the carrots, the oven and desired crispiness. After 20 minutes, the carrots will be fork tender, but they won’t be too crispy. Turn the carrots over with some tongs and let them cook a little longer, checking on them every 10 minutes. Dunking the spicy carrot fries in a cool dip takes this dish over the top! 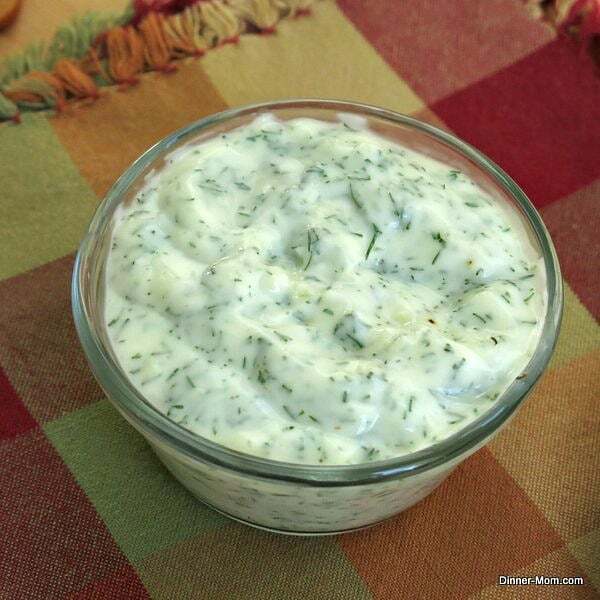 To make the sauce, mix together a cup of plain, non-fat yogurt, 1 teaspoon of lemon juice, 1 clove of garlic, minced and 1/4 cup of fresh, chopped dill. It’s totally worth it to chop up the fresh dill. And, it is easy to do. Just pull off the soft fronds from the stalk and run the knife over it a few times. Season the dip with salt and white pepper if desired…I didn’t need any! It’s great spooned over fish or blackened chicken too. Yum! At last, guilt-free fast food. Well..sorta fast, but these Baked Carrot Fries are definitely EASY! Eat an entire plate of these Baked Carrot Fries. It's okay. They're healthy, delicious and a fun way to served this vegetable. Cut carrots into french fry-sized pieces. This will vary depending upon the size of the carrots. Generally, cut carrot in half and then cut each section into 4 pieces so that each carrot yields 8 "fries." Combine olive oil and spice mixture. Pour olive oil mixture over carrots and toss to thoroughly coat, using fingers to ensure that all sides of each carrot are coated. Place carrots on a baking sheet lined with parchment paper or coated with cooking spray. Roast carrots for 30-40 minutes or until desired crispiness. Turn carrots at 20 minutes and then check periodically until done. Roasting time will vary depending upon the thickness of the carrots. Remove carrots from oven and serve immediately with dip. Combine ingredients in a small bowl and keep refrigerated until serving time. Anything that allows me to eat a whole plate of fries and dipping sauce is A+ in my book, but the flavors in this are especially up my alley! Great recipe! Thanks! I’m addicted to the spicy-cool combination. These are fun…and I feel a craving coming on right now! These look awesome! I love yogurt dipping sauces, and I’ve never had carrot fries. I’ll need to try them! I love everything about this recipe! I love roasting veggies, and these carrots paired with the dip? Yes, please! Would love to try these! That spice blend sounds so good! I hpoe you enjoy them! Made these for our Super Bowl party on Sunday and they were a big hit!